Monkey Pose helps to improve digestion, coordination, and balance, as well as stretch the back, hips, and legs. **Remember to practice breathing deep breaths and see if you can hold each pose for 4-5 breaths, if you are comfortable doing so. Make sure to invite your grown-ups to watch you do the pose. 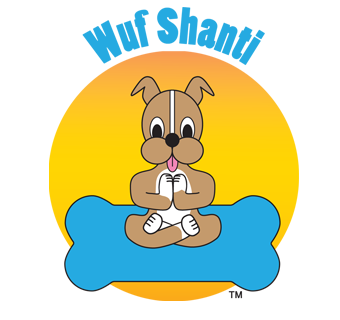 You can also practice repeating one of Wuf Shanti’s Mantras while you do the pose because part of yoga is also to clear your mind and think happy thoughts. Most importantly, remember to have fun and be gentle with yourself! Mantra: Think Well to Be Well. Begin in table pose, and step your right foot between your hands. Keep your left knee on the ground as you lower your hips towards the ground behind you. Gently fold forward over your extended right leg. Pick a pretty spot in front of you to focus on, and remember to think happy thoughts. You can make a monkey sound too if you want to have some more fun.